I wonder how they figure who does / doesn’t pay off their credit cards in a month. The Survey of Consumer Finances says only 38% of people have a credit card balance. 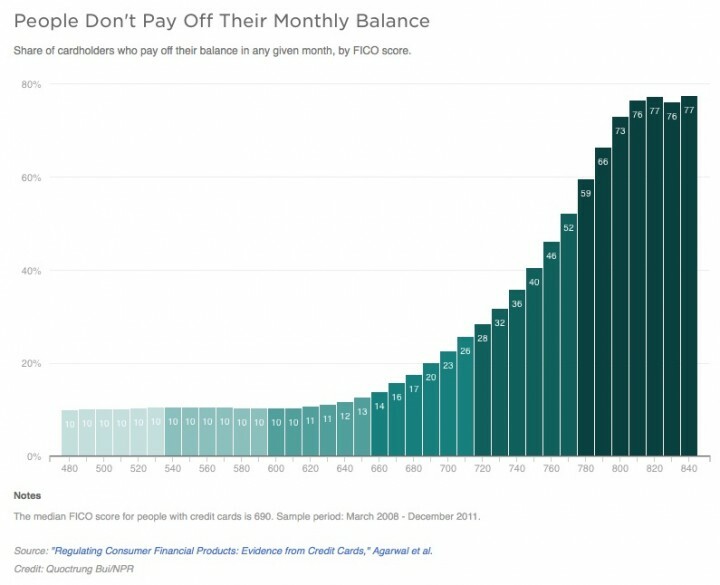 Yet here that chart makes it look like ~70% of people don’t pay off their cards. I believe the stat is something like 60% of people have credit scores of 700 and above, so the chart isn’t weighted by actual numbers of people. They could have a mean to figure out if you paid off your credit cards in a month – credit card companies report your cards balances to those “credit bureaus” on a monthly basis. I think they could sample to get a study result.